In the world of social media and content creation, we are inundated by numerous companies all vying for the top spot in the race of consumerism. Riding the wave of the next generation of immersive video content is Insta360. Let’s take a look at the three products that are causing a stir. Last year, the three-year-old consumer technology company released the Insta360 Nano, a revolutionary clip-on 360 camera for iPhone users. Not long ago, Periscope announced that they would be rolling out support for 360 cameras. This essentially enabled broadcasters to live stream in 360º. At the forefront of this announcement was none other than the Nano, which was touted as the preferred camera for use with the Periscope app. Influencer Alex Pettitt was the pioneer of the 360 live stream. Since then, numerous creators have signed up for the Periscope Producer program and have joined in on the fun. TNW was able to preview the camera, along with the companion Insta360 app. The results are definitely hopeful and the possibilities are endless. The advent of affordable consumer products such as the Nano ($199 USD). The packaging is incredibly innovative in that it can be used to view VR videos. Nothing is wasted with this thoughtful touch. Insta360 has since vastly improved its native app. The user may now directly connect to Facebook, YouTube, and Periscope from within the app. 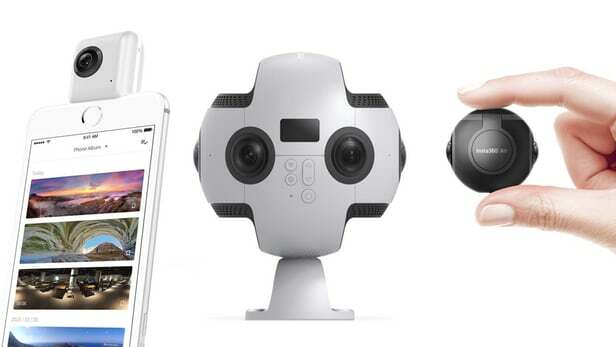 Similar to the iPhone counterpart, the Air is a portable 360 camera for Android phones. The design of this little gem looks like something out of Star Wars. The device is compatible with the same platforms as the Nano, but it also is compatible with the video-calling service Skype. Nano users are pretty envious of this feature and it does seem odd that the iPhone version doesn’t have support for the iOS version of Skype. This may change in the future as the company continues to make improvements. The price of the Air is a very modest $119 USD, adhering to the model of affordability. Furthermore, support for Periscope is currently limited to iPhone users. However, the rising popularity of this product only lends to the inevitability that we will see that door open in the near future. This camera is the next stage in creating high output 360 VR video. Insta360 unveiled the Pro at this year’s CES convention in Las Vegas. Insta360 Pro offers a powerful VR imaging system for professional photo and video creators, as well as non-professionals who demand excellence from the camera they use to pursue their creative visions. The camera’s abilities are incredibly impressive. Insta360 Pro captures up to 8K 360-degree videos and leverages six independent, high definition lenses. The camera takes 60-megapixel 360-degree 3D stills, supports both HDR and RAW formats to bring out levels of detail. Its low-light performance is unprecedented in a 360-degree camera of this size. When recording 4K video, the camera supports up to 100fps. In other words, the thing is a beast. Insta360 also paid special attention to the stitching process. Rather than using the traditional template-based stitching, it uses what is called optical-flow-based stitching. This process makes for a more fluid rendering, leading to a seamlessly clean output. The Pro can also create 3D and VR images and video in 6K. 3D and VR live streams are stitched together in 4K. Insta360 Pro can easily live-stream 4K video to any 360-degree live streaming platform and gives creators a new immersive way to share their visual masterpieces. As a standalone camera, it can be used with the iOS and Android apps and connects via WiFi, Ethernet or 4G. The app senses the camera when it is plugged in and ready to go. Now, the price is a little steep for the average consumer at $3000 USD. However, if you are looking for a serious camera that can make Hollywood-grade videos, this is your best bet. Customers can buy the Pro later this year. Visit the Insta360 website for more details and sample videos. In conclusion, it is clear that Insta360 has developed a tool for everyone that wants to produce 360 video content. The Pro packs a lot of punch with its powerful resolution. The award-winning Nano is the best portable option out there for iPhone, and the Air has many features that will make shooting 360 video for Android users exciting. Insta360 would be even better if they were able to integrate the ability to make Skype calls with the Nano, as it would certainly add an immersive feeling for those conference calls we all know and love. Overall, this company is on point with their tech and customers are generally happy. Right out of the box, the Insta360 is and easy to use, plug and play, kind of tool. Insta360 is especially relevant in their choice of timing with Periscope, which illustrates their ability to capitalize and create a wide reach with their brand. This tactic can certainly help when Facebook Live 360 is rolled out to the masses. There are a lot of cameras out there, but the Insta360 line seems to have everything covered, and are poised to take on whatever the future holds in the world of VR and 360 content. While it is hard to determine just what creators can do in 460 that is engaging, some folks have embraced the technology. Due to the fact of this tech being in its infancy in regards to the accessibility to the general public, we can only imagine the possibilities we hold in our hands.